Want to keep your adventure going deep into the night? Are you looking for an affordable, yet durable LED light bar for your SUV, truck or off-road vehicle? Then look no further! OPT7's C2 Series LED Light Bars fill that void! Durability and reliability without breaking the bank! Power cord relocated to the side allows for more heat sink per square inch. Increased heat sink fin length while adding ridges to each fin to maximize surface area for optimal cooling. 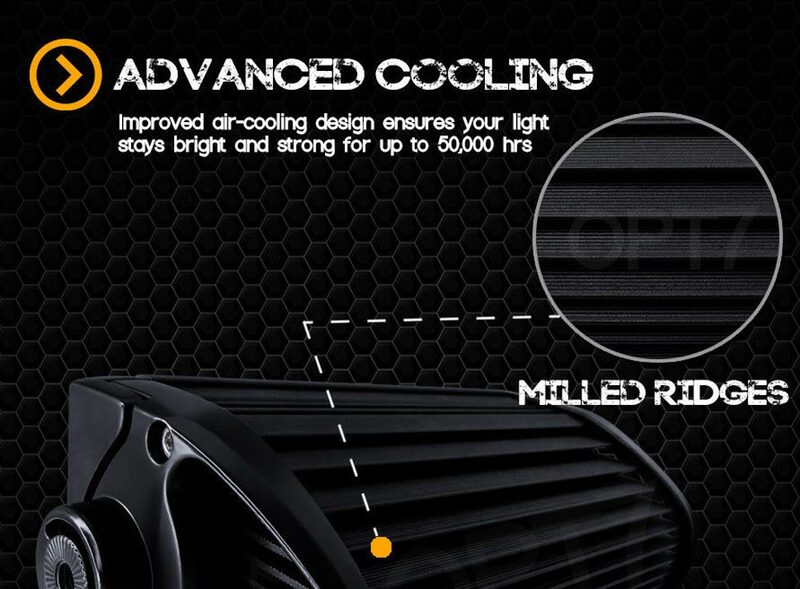 Improved cooling design puts less stress on LEDs to extend LED life and light intensity. Longer mounting brackets adds ease and clearance to adjusting the light angle. Say goodbye to foggy lenses with the Moisture Evaporator Valve™ (MEV). 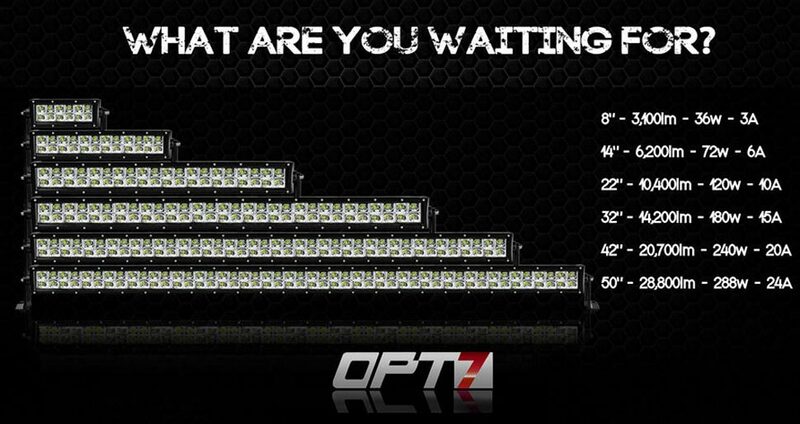 Why Choose OPT7® C2 OS Series LED Bars over others? Powder coated aluminum surface makes it resistant to corrosion. Thick aluminum mounting brackets ensures these bars stay attached should you find yourself in a rollover. Completely sealed and protected against dust. Waterproof up to 1 meter of water for 30 minutes. Advanced Bright™ Technology integrated into our Cree LEDs maximizes clarity in the light. Lower temperature allows our LEDs to run cooler and brighter. Dual beam pattern achieves light coverage [30° Spot/60° Flood]. Ridges on each fin help maintain efficient cooling. The side-to-side heat sink design allows the light bars to dissipate heat quickly and evenly. 50,000+ Hours of light will last for years. Perfect for any car, truck, tractor, boat, RV, ATV, UTV, etc. Available in 6 various legnths. Choose from 8", 14", 22", 32", 42" and 50" sizes.